The highlight is indeed pretty weak, but that's because I have some doubts as to if to use the environment effect instead or no. There are reflection textures in the PC data, so I take it using these would be okay? Both things are possible and are done around here. With an environmental effect you just need to take care that it's subtle and not excessively shiny in dark interiors. On the stamp designs I can't help you much. For the colovian tomb urns I have used some celtic knot patterns. Maybe Oak sprig - patterns? Maybe a lionhead ornament taken from textures.org or somewhere, refashioned to show a tiger head instead? The outlines of a tower with battlements? Alternatively, abstract patterns like lines or dots could work. 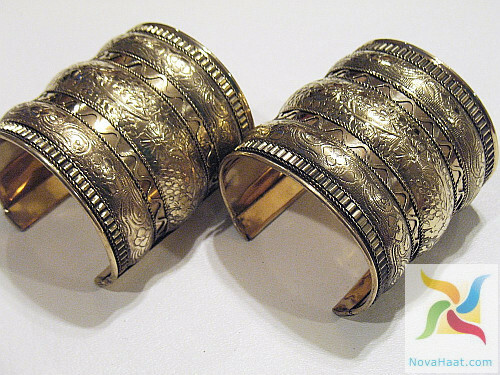 Now that I think of it, there was another jewelry item type I wanted to ask about - the bracelets. They could be implemented as armor bracers, like the Slave Bracers in Morrowind are. I'm asking it mainly because they could use designs similar to those of the rings. If you intend to make them similar blocky as the rings are, they should be make armor bracers. We already have the colovian hats, so it shouldn't be a stretch to look for these among the armor objects. Edit: Jiub, can we have those or similar coins for the Colovian tombs, too? I'm thinking about retexturing this model to fit P:C but atm I'm not sure what material to use. What about obsidian+ silver? worsas wrote: On the stamp designs I can't help you much. For the colovian tomb urns I have used some celtic knot patterns. Maybe Oak sprig - patterns? Maybe a lionhead ornament taken from textures.org or somewhere, refashioned to show a tiger head instead? The outlines of a tower with battlements? Alternatively, abstract patterns like lines or dots could work. [hsimg=]https://cdn-img-1.wanelo.com/p/527/936/ ... 54-q80.jpg[/hsimg] Although it's more fitting for Nibenay. Could include big moths encased in amber too, with very high enchantment capacity - perhaps as a gameplay equivalent for Morrowind's Telvanni helmets? Moritius wrote: I'm thinking about retexturing this model to fit P:C but atm I'm not sure what material to use. What about obsidian+ silver? Looks like what I intended for the expensive tier studded design rings. Are those gems on the side a flat texture or do they have some volume? They are flat (atm, maybe I will change them). That's why I'm thinking about using obsidian as gem. 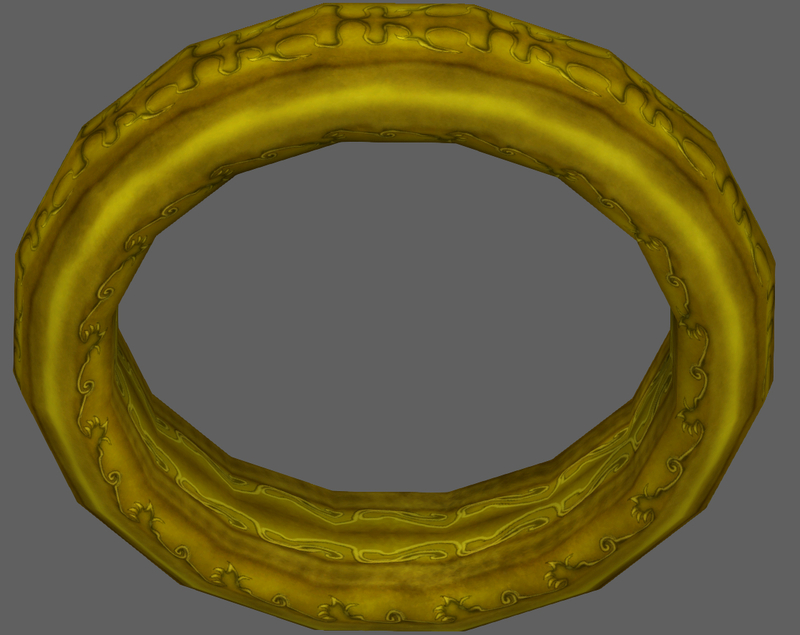 It's one of assets for my mod I'm making, released as some small mod because I always thought it's strange we can't find any of Dwemer jewellery . After some consideration I decided against adding effects to common rings - makes them grab player's attention and it's kinda bad when you find something shiny and it turns out to be just some useless 5 gold trinket. Are the steely colors fine or should I go with something warmer? [hsimg=]https://cdn.shopify.com/s/files/1/0074/ ... ge.jpg?899[/hsimg] This design could be appropriated for Nibenay, cut from wood or gemstones, or made from glass. I love these both. Nice work, R-Zero. For the studded one, perhaps just another variant made of bronze instead of steel? A lot of excellent work here. This goes some way in clearing up the gaps in our item database. 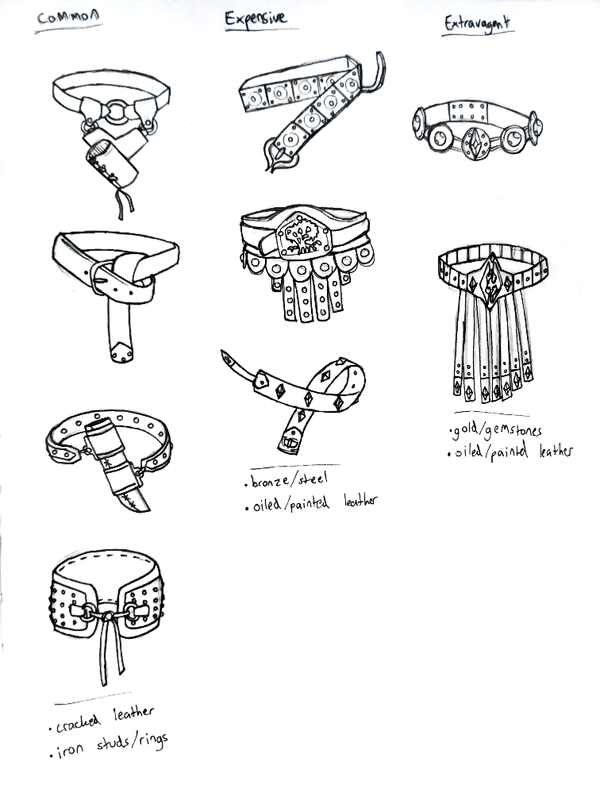 If possible, I'd also like to see some designs for belts and amulets. Infragris wrote: If possible, I'd also like to see some designs for belts and amulets. Well, making the coin amulets at least would be pretty easy. Other than that, there aren't many amulet ideas in this thread, so there must be a bit of research beforehand. P.S. Oh wait, or did you mean exactly that? worsas wrote: For the studded one, perhaps just another variant made of bronze instead of steel? Will do. The design should be changed somewhat though, do avoid the "palette swap" look. I'm thinking either different chape of studs or an additional row. 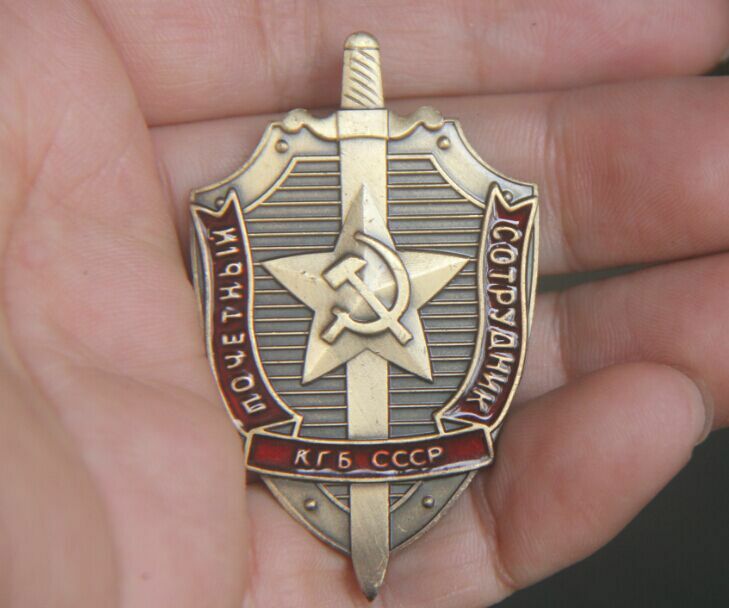 I have an unfinished concept lying around somewhere, for Colovia it'd be cool to do various military service pins and medals that we could classify as "amulets" for gameplay purposes. Especially since it doesn't show up on the character, we don't necessarily need to be restricted to "thing that hangs around your neck". Saint_Jiub wrote: I have an unfinished concept lying around somewhere, for Colovia it'd be cool to do various military service pins and medals that we could classify as "amulets" for gameplay purposes. Oh yeah, you mentioned it, sorry. These would fit nicely I think. Romans used Phaleras in place of badges, so some designs could be taken from these. There are also some fitting motifs in vanilla imperial armor textures, like the lion head on the Templar Cuirass. I think generic amulets should be the majority thought, to avoid to big a contrast with already established framework. P.S. Made a warm-colored variation of the studded ring, added studs to the signet ring to increase uniformity. Hey, here's the download link for the ancient coins: https://www.dropbox.com/s/kill3ppefb25a ... s.zip?dl=0" onclick="window.open(this.href);return false; Sorry I'm late on it! Saint_Jiub wrote: Hey, here's the download link for the ancient coins: https://www.dropbox.com/s/kill3ppefb25a ... s.zip?dl=0" onclick="window.open(this.href);return false; Sorry I'm late on it! Grabbed, thanks. These would probably be better put on a chain instead of the usual amulet string. These are some very nice concepts! Love how they look almost military, or at least very utilitarian in shape. The only problem I have with them is that all these represent the same material type (leather). There should be at least a bit more variety I think, with some belts made of wool or something. R-Zero, would you mind, already uploading the three colovian rings above, so I can start adding them? I'm currently preparing PT_Data.bsa and pre-adding objects for later addition to the esm. worsas wrote: R-Zero, would you mind, already uploading the three colovian rings above, so I can start adding them? I'm currently preparing PT_Data.bsa and pre-adding objects for later addition to the esm. Ack, I wanted to mess with them a bit more But sure, done. Doesn't look bad for a WIP, but it is a little generic and not really indicative of Colovian culture (look at Saint_Jiub's concept art earlier in this thread for examples). The vanilla game already contains several generic belts, so any additions should be distinct and serve to enhance the feeling of a unique culture. In the case of small items like this, it is generally okay to go for a bigger texture size. Unlike TR, we do not insist on parity with the vanilla textures. Infragris wrote: Doesn't look bad for a WIP, but it is a little generic and not really indicative of Colovian culture (look at Saint_Jiub's concept art earlier in this thread for examples). The vanilla game already contains several generic belts, so any additions should be distinct and serve to enhance the feeling of a unique culture. Alright, this one is close to what I imagined the final version to look like. I was going for a military, but slightly ornate look. It's loosely based on multiple of Saint_Jiub's concepts. That large metal rectangle on this belt makes it pretty colovian, in my opinion. Your new variant, however, looks like a piece of garment for legion members. The dragon insignia doesn't show up on everyday garment. As a little nitpicking. The dragon motif is missing the diamond atop of it. What is that pebbled material on the front of the belt? Your first post says spider silk but this doesn't read as silk, for me. The rest of the design is very Colovian too, so silk might not be the best fit thematically. How would it look if you made it wool or something like that? worsas wrote: That large metal rectangle on this belt makes it pretty colovian, in my opinion. Your new variant, however, looks like a piece of garment for legion members. The dragon insignia doesn't show up on everyday garment. Thanks. Yes, spider silk was actually the look I was going for before I made the texture, but the final version is supposed to show some sort of dyed leather. The diamond is only left out in the post-Septim period, to signify the end of the dynasties blessed by the Chim-El Adabal. It should still appear in our time period. Infragris wrote: The diamond is only left out in the post-Septim period, to signify the end of the dynasties blessed by the Chim-El Adabal. It should still appear in our time period. I made a ring inspired by the weatherward circlet in Oblivion. 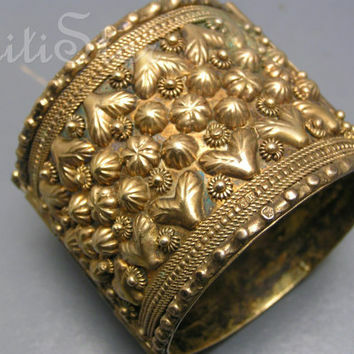 Maybe this can be a higher class Nibenese ring. The close-up details are very nice, but ingame you will not make much out of it, I'm afraid. Maybe it would help, if you filled one of the spaces between the line pattern with a different metal color? And maybe give the lines a different color aswell? You could go by brass/copper/silver or something like that. These are just my thoughts on it. This topic has produced a lot of excellent rings, but we could still do with more belts and especially amulets.